Plans to demolish the former home of a 144-year-old pottery manufacturer to make way for flats have been submitted. Poole Pottery, at the town's quay, closed in October after owner Denby failed to reach an agreement with the landlord. Developer Fortitudo now hopes to create a mixed-use development at the site which will include a shop and 95 apartments. The neighbouring former Swan Inn will be revamped into an apartment and unit. The Swan, which will not be demolished under the proposals, is one of many buildings in the town where examples of work by Carter's Tiles, which became Poole Pottery, can be seen. 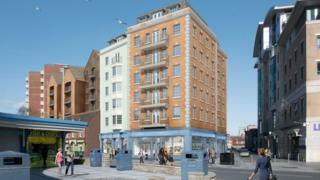 The proposals have been submitted to Borough of Poole council. Poole Pottery was founded by a builder's merchant and ironmonger in 1873 and remained at its original site until the closure. A petition by Poole Pottery Collectors Club to keep the pottery manufacturer shop open gathered more than 4,000 signatures. Production of the pottery continues at Middleport Pottery, Stoke-on-Trent.